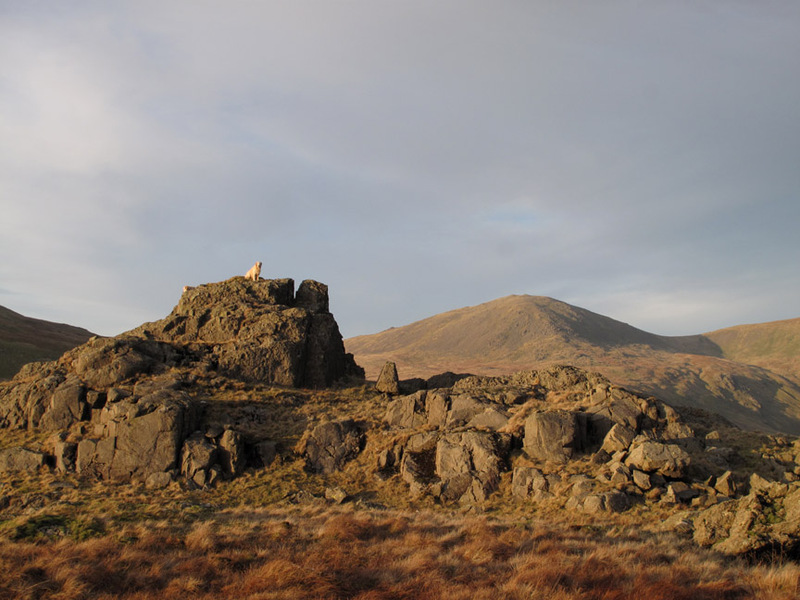 " Fine days lead to Middle Fell "
Date & start time: Sunday 15th January 2012, 2.10 pm start. 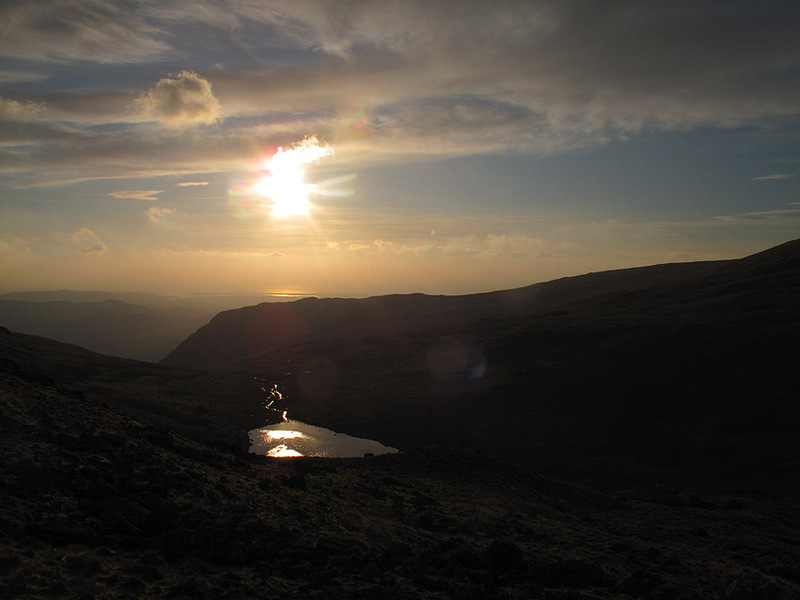 Places visited : Greendale, Middle Fell, Greendale Tarn, Greendale Gill and back. 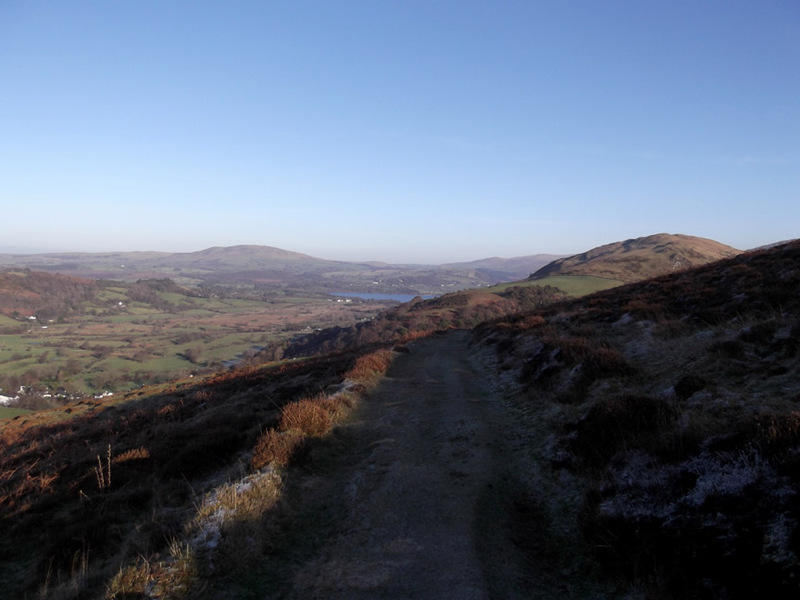 Walk details : 3.75 mls, 1675 ft of ascent, 3 hrs 15 mins. 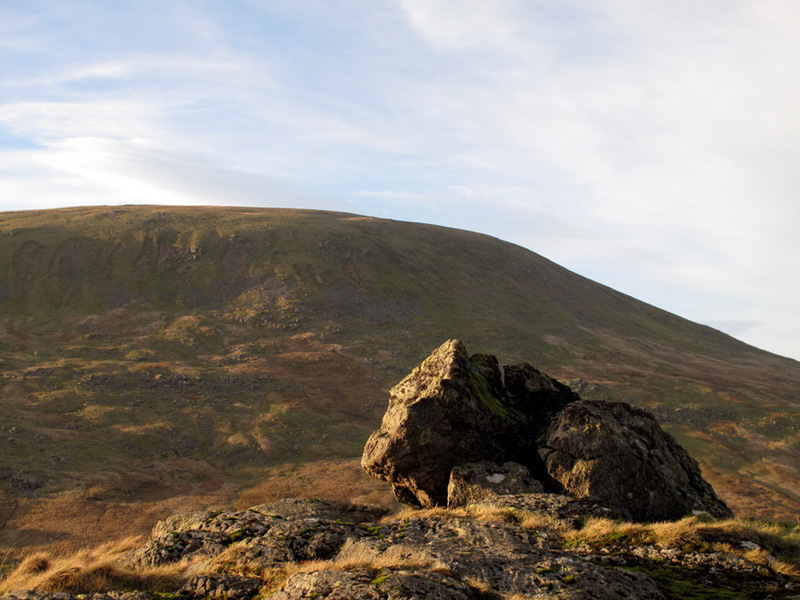 Highest point : Middle Fell summit 1,908ft ~ 582m. 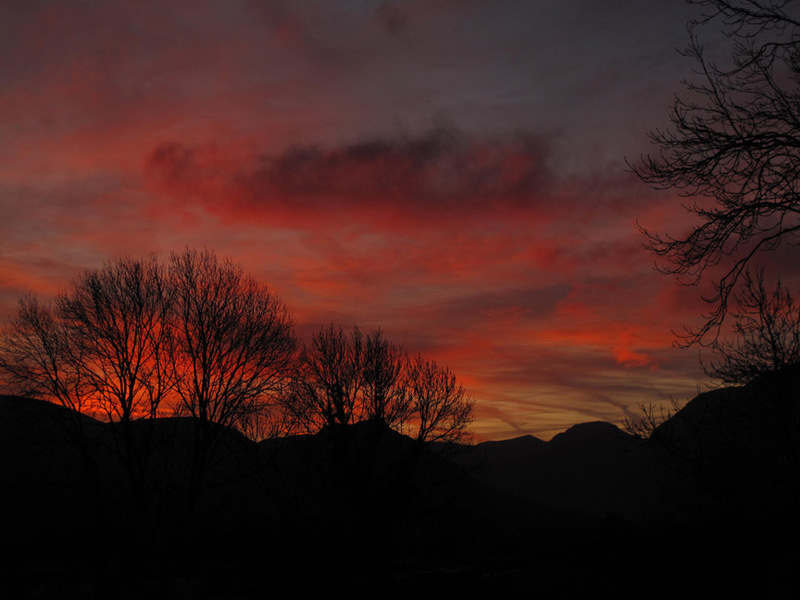 Weather : A cool clear afternoon with a little high cloud, lower further east. 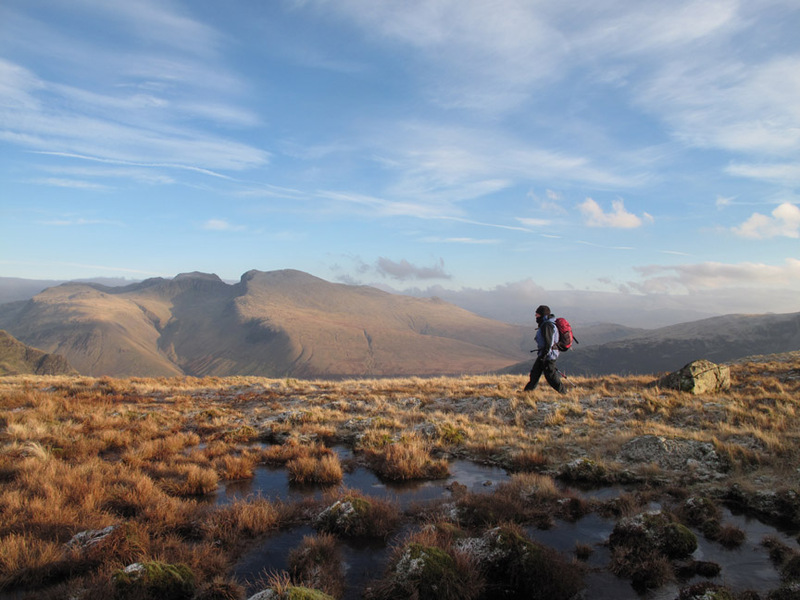 A few days of fine weather allows us to get out again, first to Ling Fell. Before that, it was Harry's birthday on the 13th . . .
and he qualifies for a birthday cake with eight candles this year.
" Star-date 13.01.12 " . 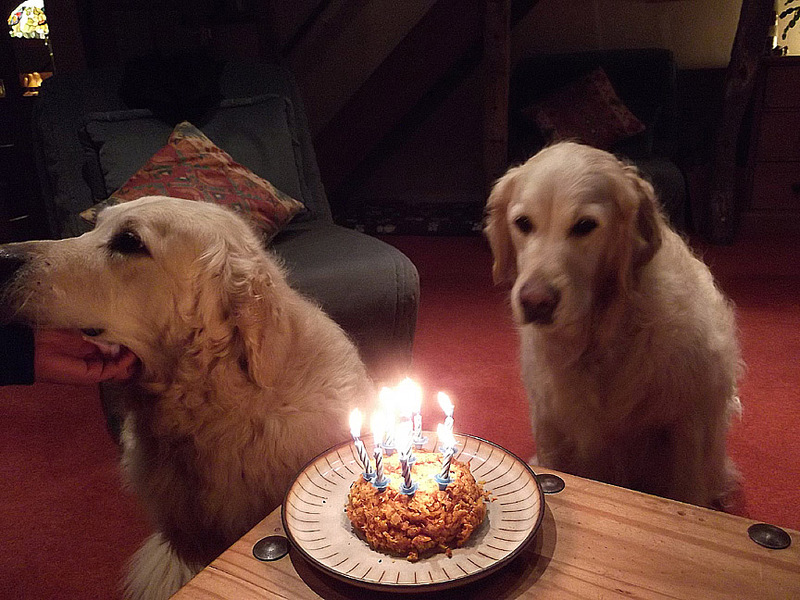 . . Harry would like some cake but he's not sure of the candles. Bethan would love to eat it too but can't blow the candles out . . . she's seen it done before . . . but can't remember how to do it. Cake Recipe : Take some grated carrots, an egg, breadcrumbs and some light cheese, mix and bake for a short while. Remember to add the candles after taking it out of the oven, not before. I was up early for work and glanced out of the window . . .
A cold, frosty start . . . and a beautiful day. Pity about having to go to work ! 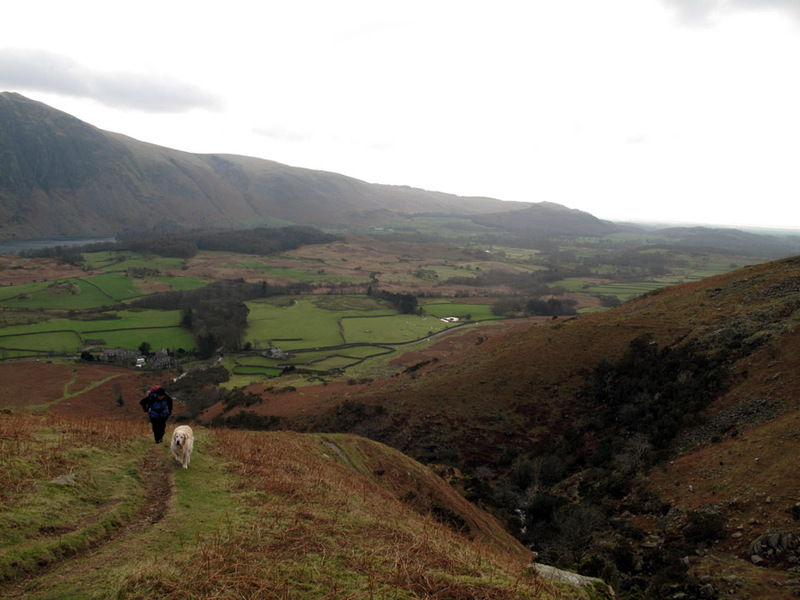 Ann took a walk up Ling Fell so that the dogs could work off all that cake. 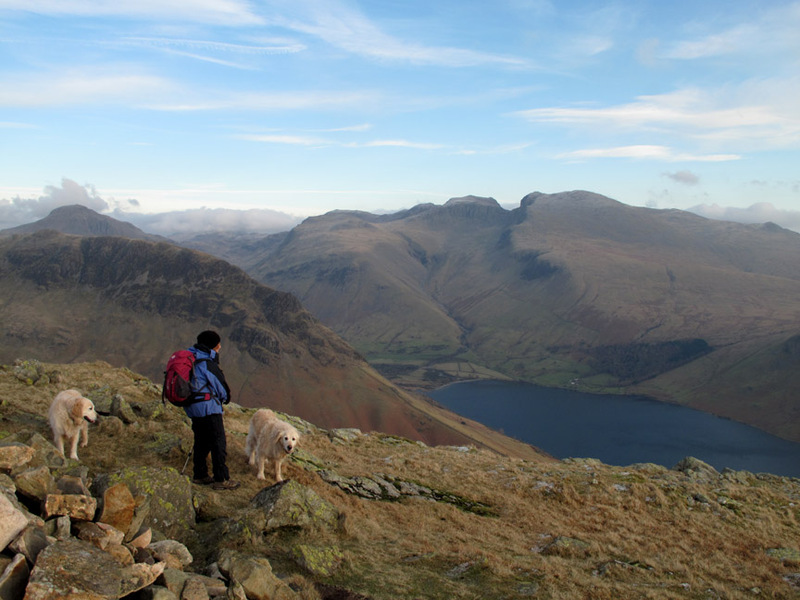 On Sunday we make our way over to Wasdale for a long awaited walk up Middle Fell. At this time of year it gets dark early and we are too late to do the Greendale Horseshoe. 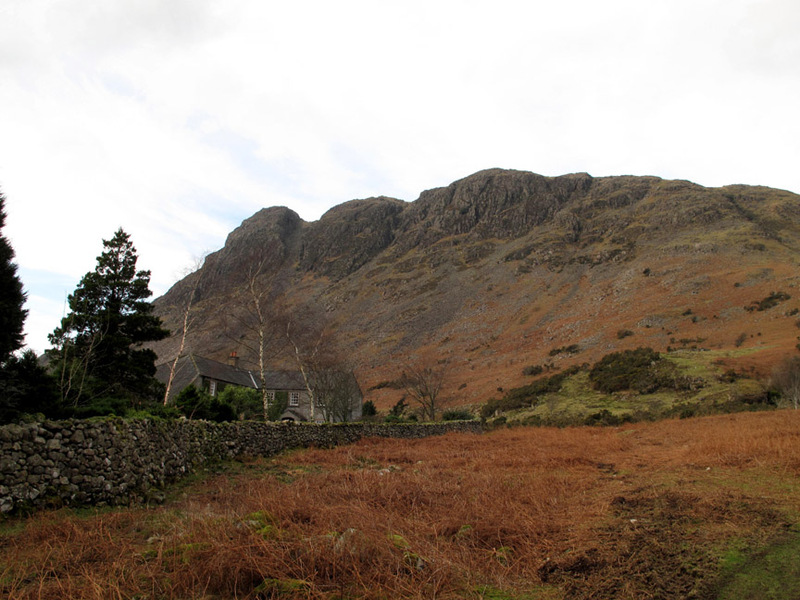 Scafell and Scafell Pike as we leave the car and start our walk up the fell. 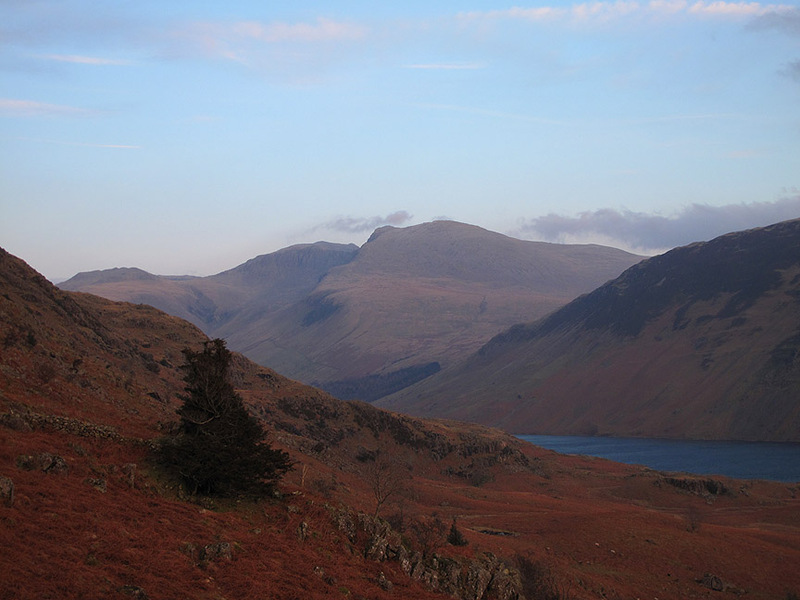 of the Scafells, Illgill Head and the Wasdale Screes. 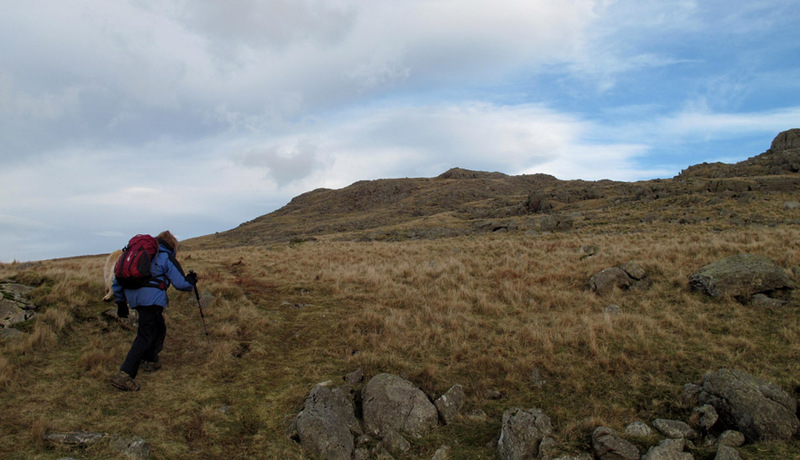 but around here we break away in favour of a path to the right which heads directly for the top. We'll leave the gill-side path for our descent. Best foot forward as Ann tries out her new rucksack. 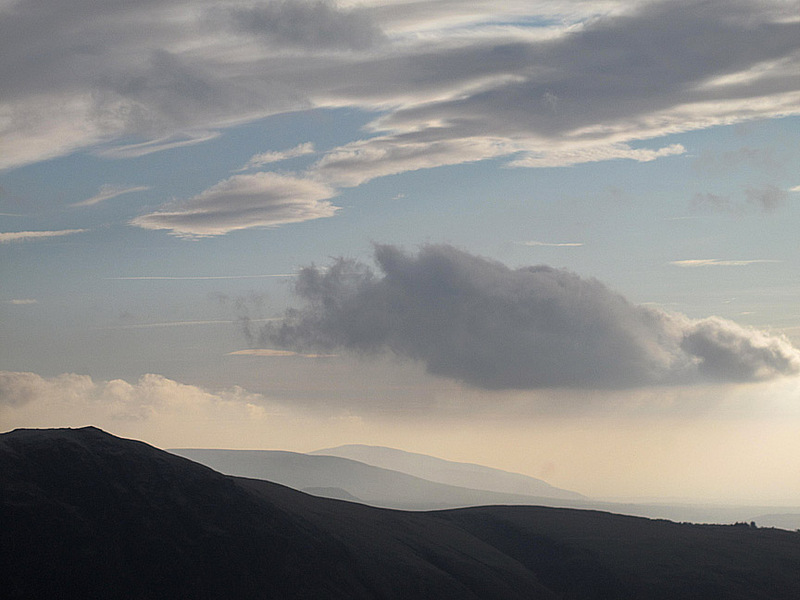 Looking back at the view across to Black Combe in the distance. It took so long to get a half-decent photo that Ann was way out ahead. 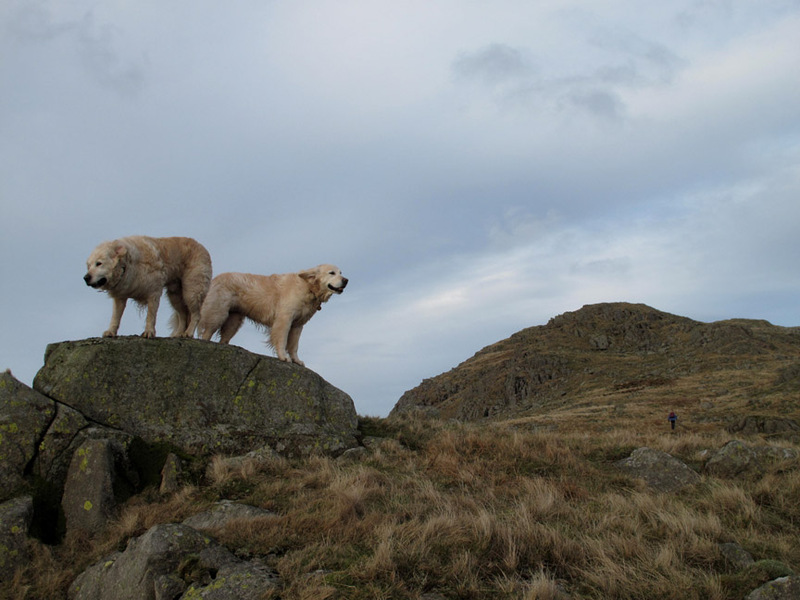 Obviously the dogs need more fell-top posing practice . . . sadly missing over the last few months. 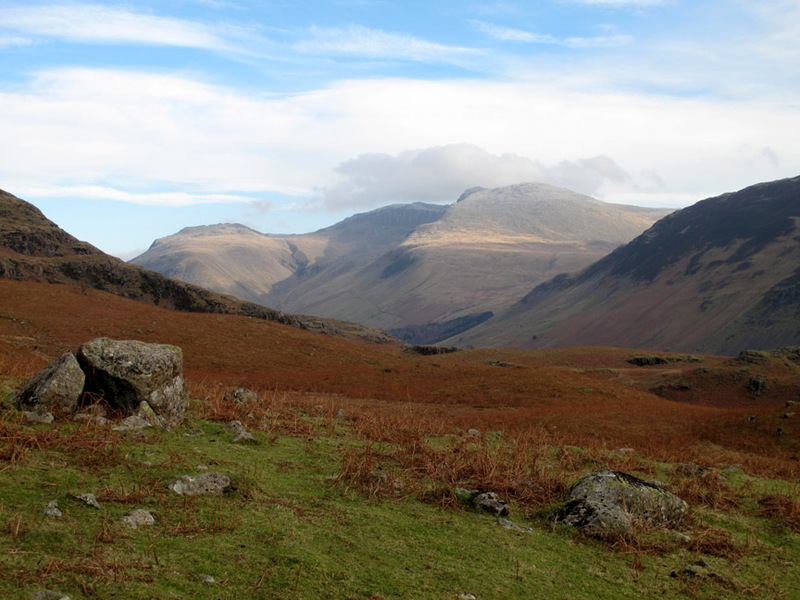 as we look across at the gap of Mickledore between the two Scafells. 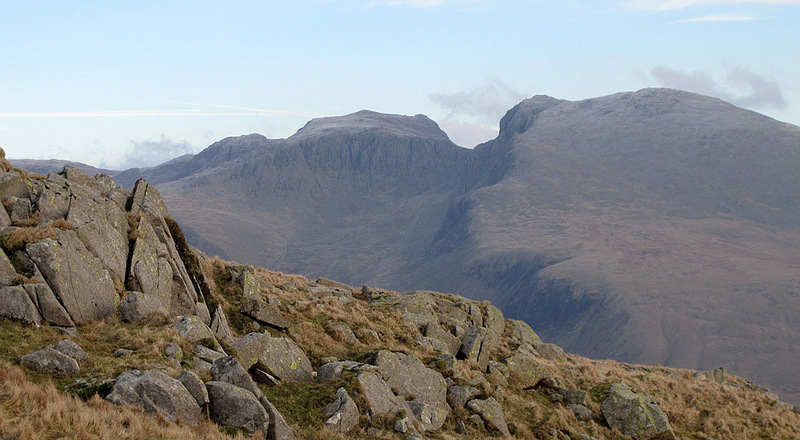 The highest point in England is the middle summit of the left hand peak, despite the optical illusion created by the nearer Scafell to the right. The summit reached . 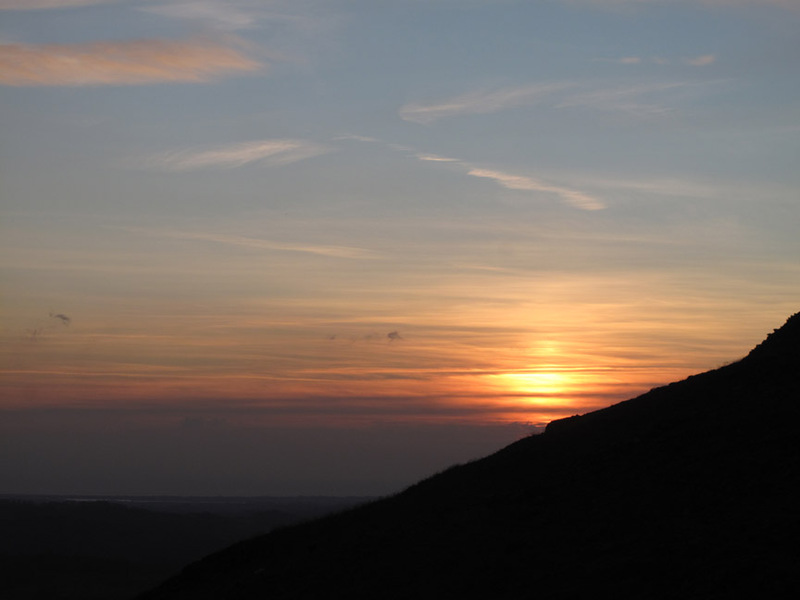 . . there's time to stop and fully admire the view. 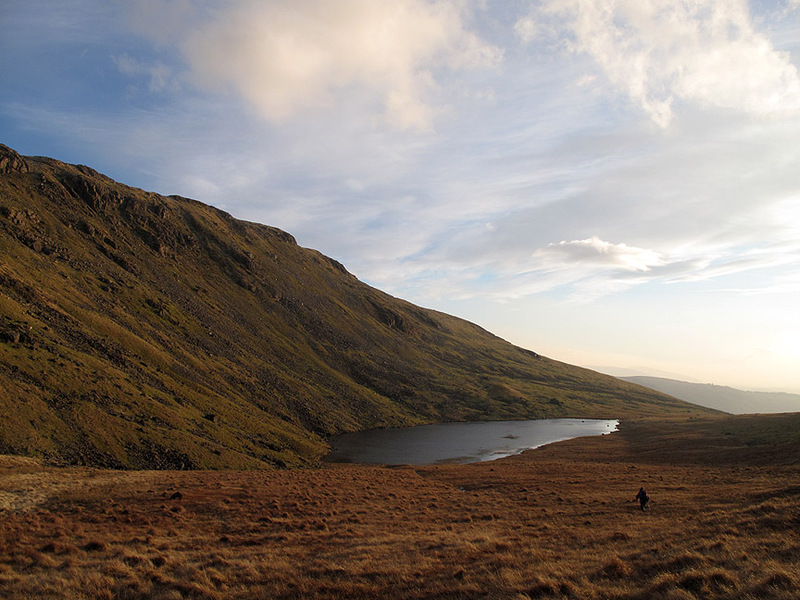 Cloud over distant Glaramara intrigue us as we sit and enjoy a late sandwich lunch. There's a cold breeze and a hot soup from the thermos is most welcome. 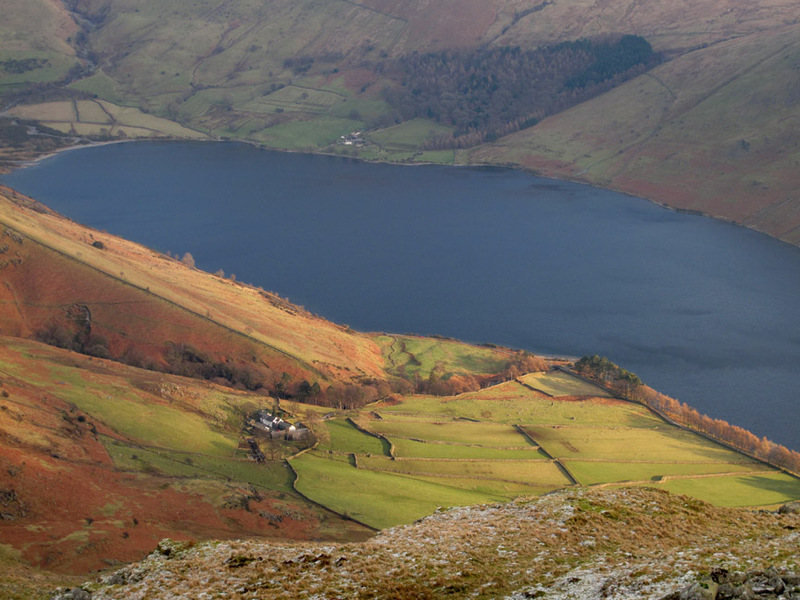 Click here or on the photo above for a wider Loweswatercam annotated panorama. 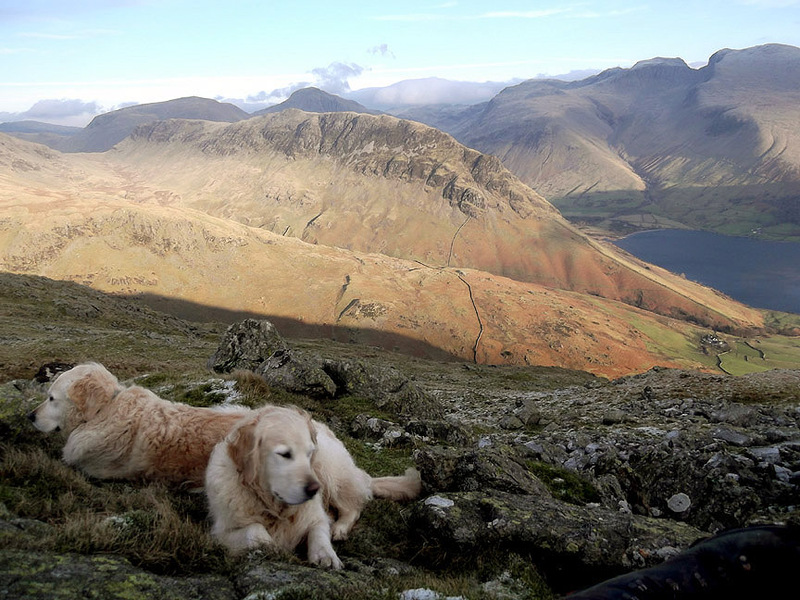 and Bowderdale Farm below us was able to enjoy some direct sunshine at last. 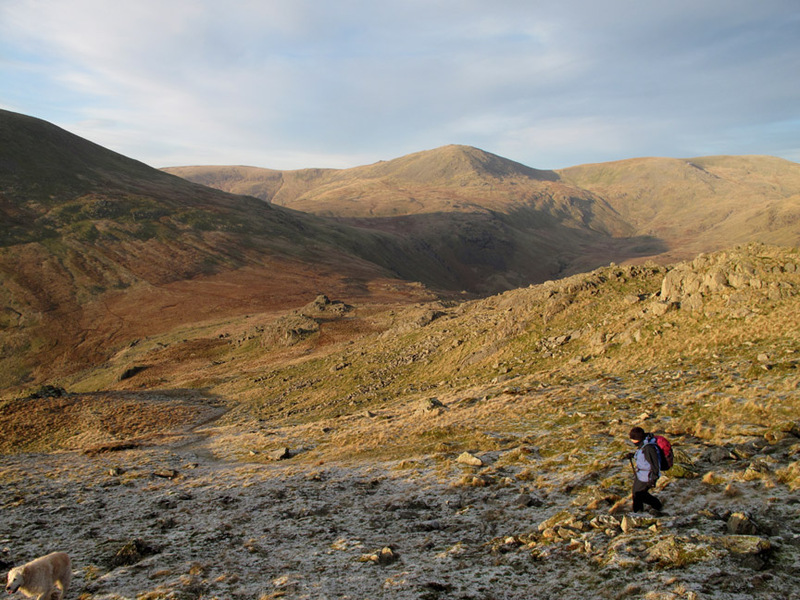 Ann strides out across the partially frozen summit of Middle Fell. 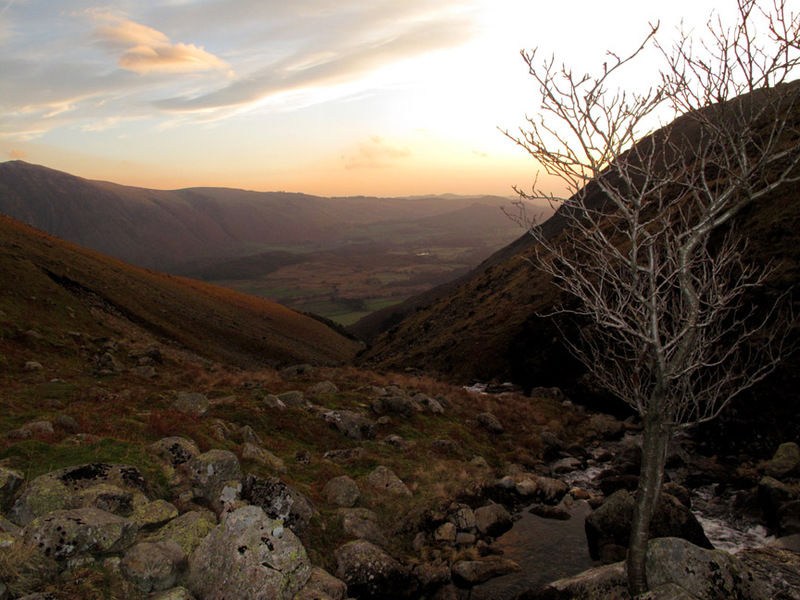 Frost on the grass as we descend the northern end of the fell. A ancient dinosaur stands sentinel over the route. Looks like a Tuatara to me. I'll try that sitting on the top of a rock-thing again. Harry has the patience to let me walk back . . . but Bethan is distracted by something off to the left. Ann meantime was ahead . 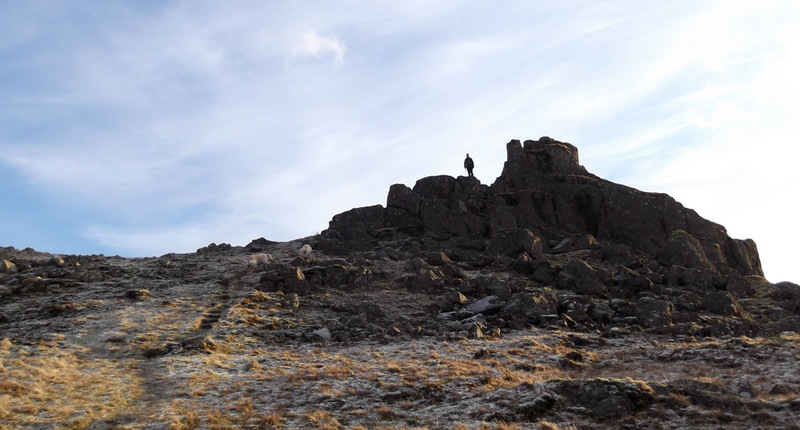 . . and pictured me on the same rock outcrop. Into the sun again . 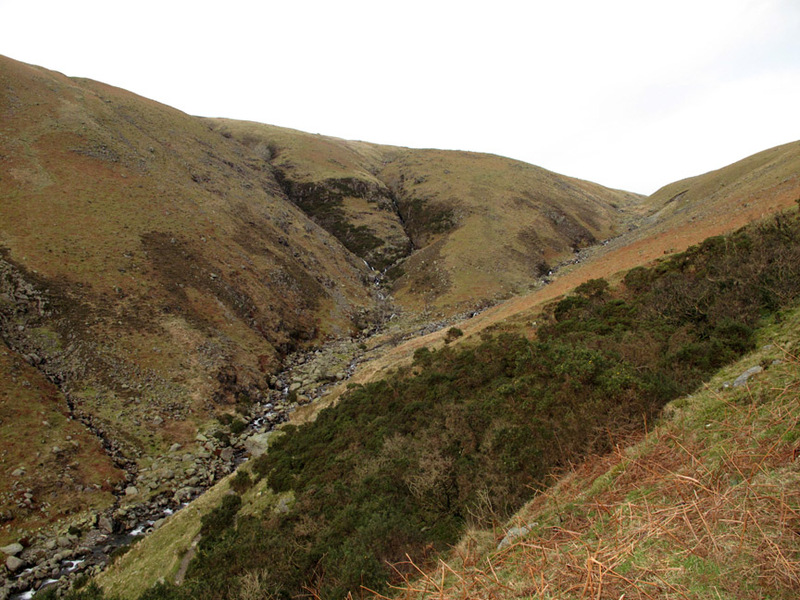 . . the brightness lights up the ribbon of Greendale Gill as it flows out of the tarn. Circling round we head left . . . following the damp path across the moorland grass. 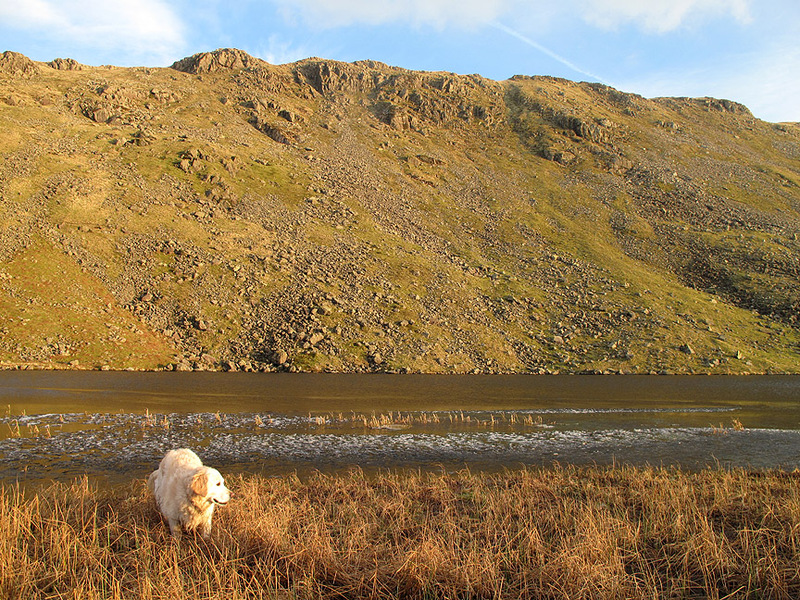 A little ice has formed around the edge of the tarn. 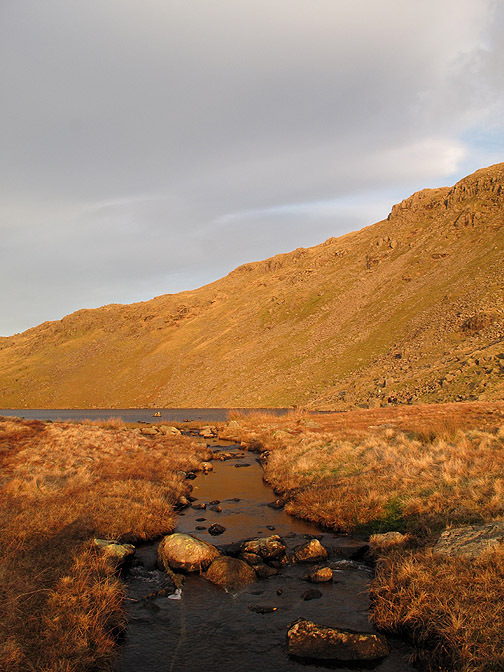 The summit of Middle Fell is directly ahead across the water. Down at the outflow . . . and that afternoon sun adds a lovely yellow glow. Stepping stones . . . with care. 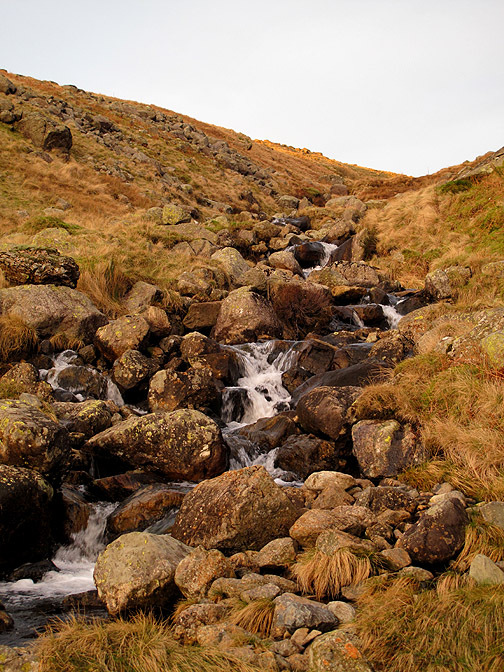 The steep descent follows the beck down. Winter branches look silver on the birch tree as the sky starts to change colour again. Closing the circle as we reach the path junction where we struck up for the summit earlier in the afternoon. 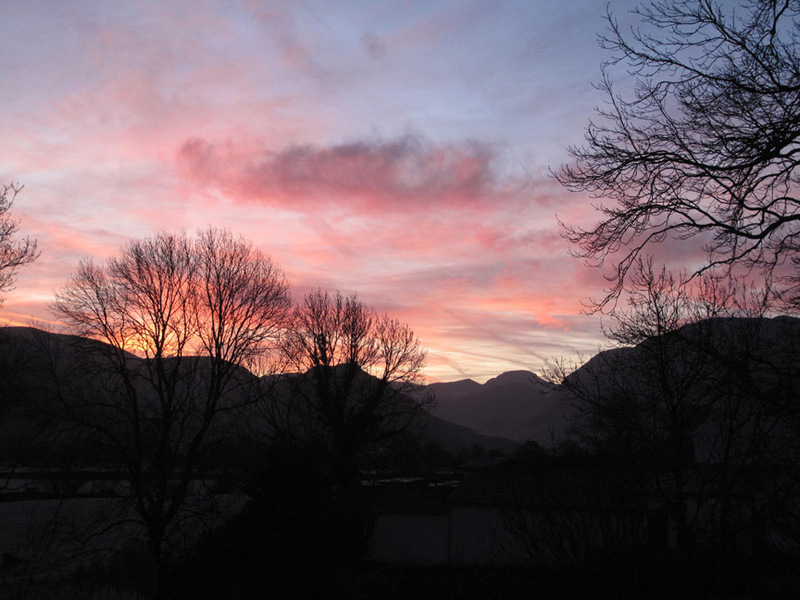 Fading light over the Scafells. 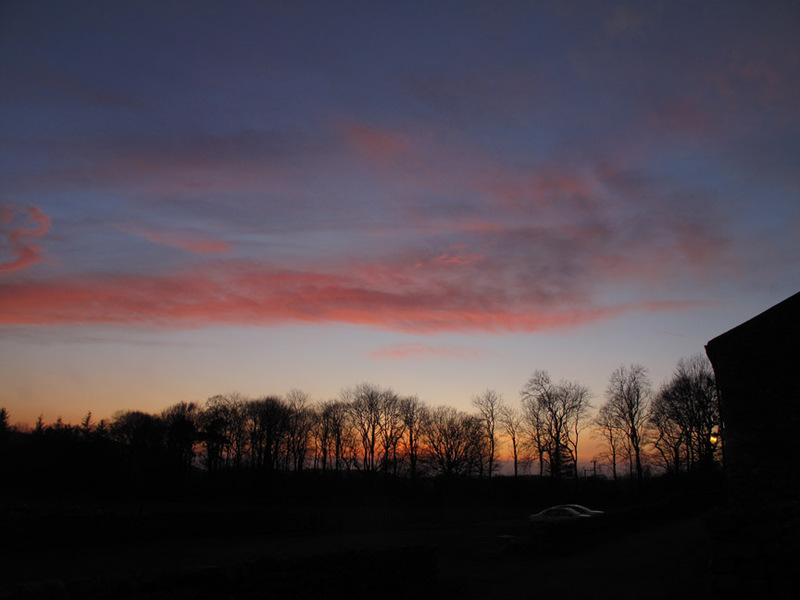 but the subtle colours are wonderful nevertheless. Back at the car . . . perfect timing. Now where shall we go for a little light re-hydration ? Technical note: Pictures taken with either Ann's Fuji Finepix Compact or my G10 Canon digital camera. This site best viewed with . . . A pint of Howard's Wasd-Ale in the Horse and Groom in Gosforth.